Ride the elevator to the top levels of N Seoul Tower, a broadcast and observation tower. 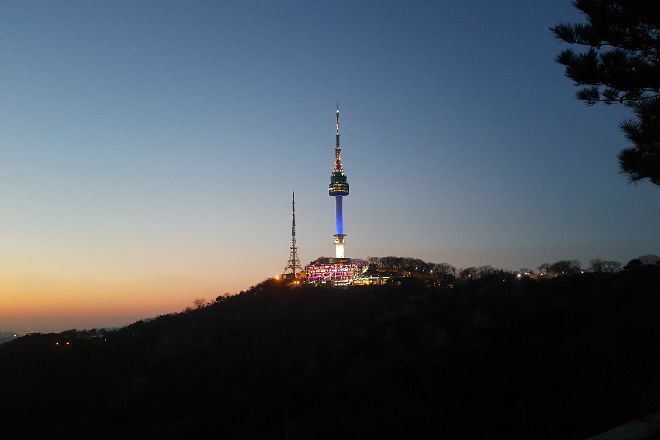 Serving as South Korea's first general radio broadcasting tower, the 236.7 m (777 ft) structure also includes four floors of attractions interspersed with observation platforms. Visit the teddy bear museum and stop by the observation points, or take a seat at the French or Korean restaurant to dine with sweeping views of Seoul below. Check out the roof terrace and its thousands of "Locks of Love." Before you head to Seoul, plan trip itinerary details with our user-friendly Seoul online journey maker , to make sure you see all that Seoul has to offer, including N Seoul Tower. Went up to N Seoul Tower which was a very strenuous walk right up and with lots of steps. If you are not in good condition, take the cable car and go down instead. I'm in good shape but was very tired once I got up. Well up in the tower so had a view of the whole Seoul and it was worth the walk. Recommend to make this excursion. Classic vantage point with spectacular views. I reached the Seoul Tower in the evening. The lighting is striking and the skyline of the city really nice. The location can be reached on foot or by bus. On site you will find classic tourist attractions: restaurants, kiosks, souvenir shops. There is also this tradition (as in Ponte Milvio in Rome) for couples of lovers, to attach a padlock with phrases and drawings to the review on the network of the top floor of the tower. Seoul is a majestic and endless place at the foot of the tower. N Seoul tower is The very famous land mark in Seoul. Various pleasures, beautiful sightseeing, many scientific things, everything is amazing. That's it! When you visit in Seoul, please be sure to visit here. You won't be disappointed. N Seoul Tower is one of the most popular (and best) tourist destinations in Seoul. At night, the view is truly stunning. Even from the ground, you can see the entirety of Seoul sprawling underneath you. I personally recommend paying the 10k won to go up to the obersvation deck in the actual tower. 360° view, a cafe, gift shop, and restaurant serving traditional Korean cuisine. 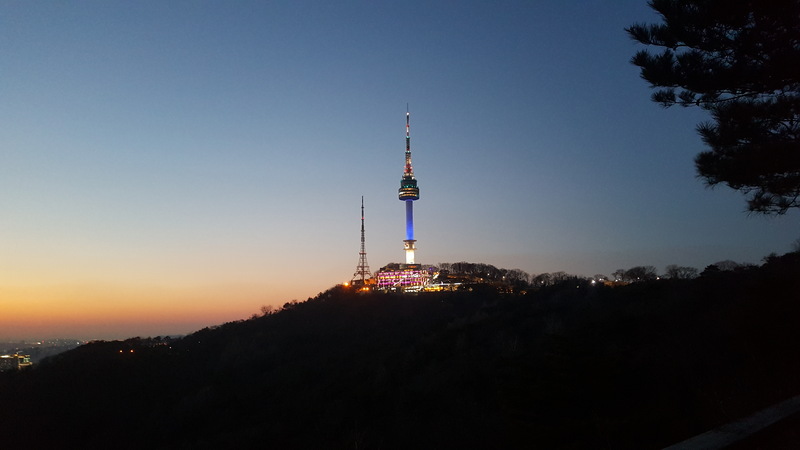 You can hike (a 1.5km set of stairs), take a bus, or take a gondola to the top of the mountain where the N Seoul Tower stands. I love it. I went there when the cable car was broken, it's a long hike! Older local Korean People are very strong. Good opportunity to bring your own love lock. They have the glow in the dark love lock. It's not very expensive when you want to go to the top. A great experience to see Seoul city from Namsan Tower. Every day, we help thousands of travelers plan great vacations. Here are some tips on how to use your Listing Page to attract more travelers to your business - N Seoul Tower. Promote your permanent link - https://www.inspirock.com/south-korea/seoul/n-seoul-tower-a444441039 - on your website, your blog, and social media. When a traveler builds a plan from this page, the itinerary automatically includes N Seoul Tower. This is a great way for travelers looking for a great vacation in your city or country to also experience N Seoul Tower. Promoting your link also lets your audience know that you are featured on a rapidly growing travel site. In addition, the more this page is used, the more we will promote N Seoul Tower to other Inspirock users. For best results, use the customized Trip Planning Widget for N Seoul Tower on your website. It has all the advantages mentioned above, plus users to your site can conveniently access it directly on your site. Visitors to your site will appreciate you offering them help with planning their vacation. Setting this up takes just a few minutes - Click here for instructions.